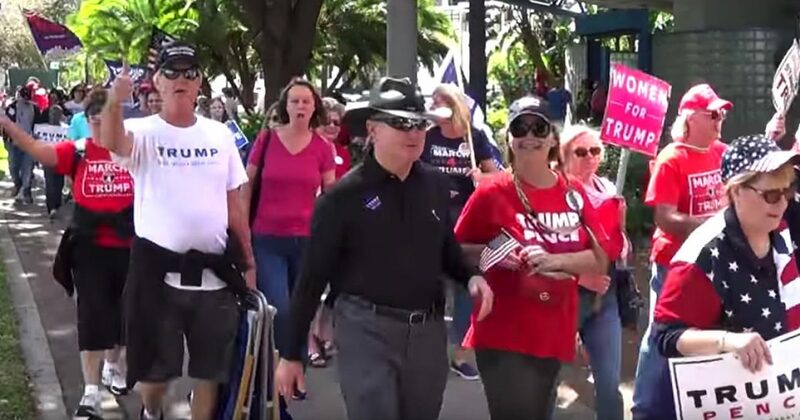 I performed my original song, “We Are Americans” http://bit.ly/2lOjJll at the Orlando March 4 Trump Rally. It felt like a family reunion seeing patriots from the early days of the Tea Party movement; lots of hugs. The mood of the rally was electric. Everyone was happy, excited and fired-up about President Trump. To the fake news media and Obama http://bit.ly/2lEpjrp who think their orchestrated lying campaign to destroy Trump is working, I say, “Forget about it! It ain’t workin’!” Trump-mania is alive and well, stronger than ever! Vendors were selling Trump caps, t-shirts and everything in between including Trump welcome mats. One elderly patriot adorned head-to-toe in red, white and blue Trump paraphernalia told me she feared putting a Trump welcome mat outside her front door. She said it is unfair that we cannot freely support our president without fear of attacks. The emcee instructed all us speakers to stay close to the stage. However, I knew there were a few speakers ahead of me on the program so I wandered away into the crowd to chat with people. I met a white woman who is chair of a Republican Club. She said they have been reaching out to blacks in a sincere attempt to add more diversity to their club. She asked my advise. I chuckled and said, “Good luck with that.” I have been trying to get blacks to break their mindless loyalty to the democrats for over a decade. Still, I told the patriot sister to keep trying. With God’s help, suddenly mindsets can change. Everyone was excitedly buzzing about Trump tweeting about Obama bugging Trump Tower before the election. http://fxn.ws/2mRJdjm Enraged fake news, democrats and other leftists bash Trump for tweeting declaring it un-presidential. Clearly, Trump supporters, over 60 million Americans love it. They love Trump speaking directly to them, bypassing Leftist operatives disguised as mainstream media. An Asian female speaker addressing the crowd said it took her 35 years to become a legal US citizen with the right to vote. She expressed how proud she was to be an American. The audience went nuts. They loved her. Representatives from Hispanics, women and blacks for Trump spoke from the stage. They were warmly and enthusiastically embraced by the crowd. We were family, united in our love for our country, excited about President Trump and his agenda; putting America first and making her great again. Such was the theme of the day. I chatted with blacks at the rally to support Trump. Interestingly, they were entrepreneurs. It is funny how when you’re a business person trying to achieve your American Dream, you are well aware of the road blocks placed in your path by high taxes and the government’s tyrannical, absurd regulations. The biggest thing I noticed at the Orlando for Trump rally was the obvious political growth and political sophistication of the participants. Back in the early days of the Tea Party movement we were naive patriots. We thought we were fighting only against the socialist policies of a left-leaning president and the democrats. Today, we know our enemies: radical Leftist Obama and his army of thugs; the fake news media; the corrupt Washington DC political establishment (Republicans and Democrats); and NeverTrumps – united in their mission to destroy Trump’s presidency. We the People are politically well educated and well-organized. We are spiritually, emotionally and intellectually locked and loaded, really for battle – really to support and defend our new president. Please continue moving forward, Mr President. We the People have your back!